Q EDITION is not just a shower, but extraordinary showering. Crafted with high quality materials, it has been designed with individuality and style in mind. From the seamless motion of the multi-functional Q lever to the customisable metallic accents in finishes such as Rose Gold or Black Chrome. MyQ gives you the ability to choose from a range of six pre-set experiences that we have created for you to suit your mood and lifestyle, like Sport, Eco or Comfort, as well as the option to create and save your own shower experiences so that you can repeat that perfect shower every time. Intuitive and easy to use, with its simple on/off touch switch, Q EDITION greets you with a friendly Hello displayed on its screen before it powers on. 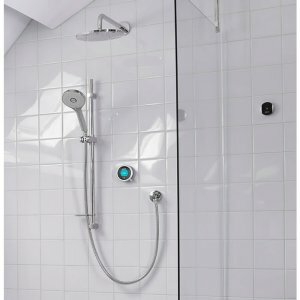 Its warm up feature will hold the water at your desired temperature until you're ready to start your shower, and the multi-functional Q lever adjusts the flow when you move it up and down and takes you to the menu when you press it. As with all our smart showers, it comes with a remote control so that you can power on your shower and have it perfectly pre-warmed before you step in. Effortless, elegant, intuitive, smart. Q EDITION is one extraordinary shower.